That’s the face of a little baby that just got her poor heart broken. Do you know what I had to do yesterday? Do you?? I had to tell Baby Phan that her football team stinks. Not regular stinks, but really, really stinks. You see, I try to be a good father and brainwash my child to love and hate the same things that I do. This means doing things like having her wear Philly sports related clothing as often as possible and encouraging her to play with my Phillie Phanatic toy. It really hasn’t been too hard because Baby Phan seems to truly like Philly teams. 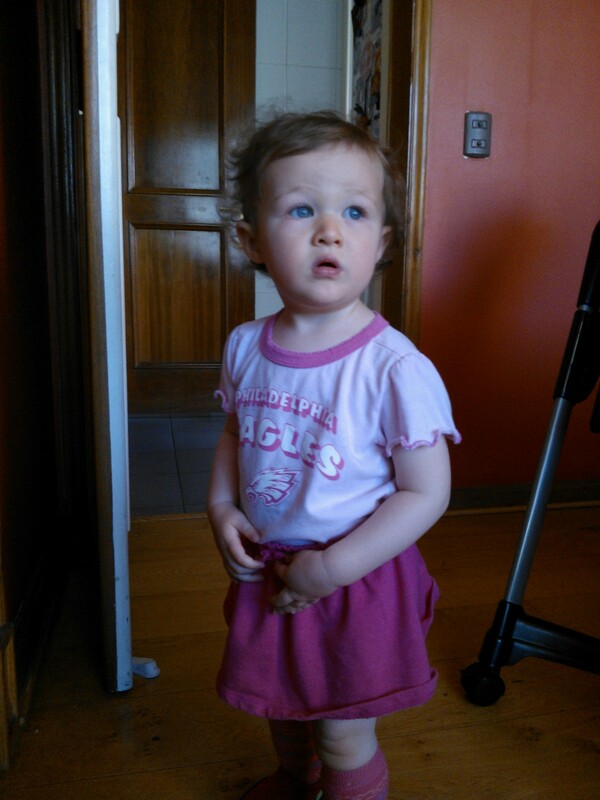 She actually picked out that Eagles onesie on her own. She made me sing “Fly Eagles Fly” at least 100 times, which I gladly did. She’s learning how to spell EAGLES. Baby Phan cheers and boos appropriately. She’s all I could’ve hoped for in a daughter. This entry was posted in The Eagles and tagged andy reid, Eagles, effigy, enough, heartbroken, insanity, total insanity. Bookmark the permalink.